This is an interesting piece. It is German (Almain) and has a hand defence that slides thru a groove via a rivet. It is one of the better pieces in my collection given the rarity and provenance. This piece was the property of Claude Blair, Antony Dove and Ian Eaves and was restored in the Tower Armouries in 1951. The diagram, below, shows the restorations. All of the leather is modern. The elbow defense shows the Nuremberg town mark. This piece is interesting from a number of standpoints. First, armors, even fragments such as this from ca. the magic date of 1500 are rare. While it is heavily restored, the original parts are in excellent condition and the restorations are by way of additions of elements as opposed to a physical reconstruction. Second, it raises the question of fakes and provenance. Perhaps at some point we can have a thread discusssing fakes, in the meantime read Lee's excellent treatent of fakes here. Suffice it to say that ancient armors are faked and have been for a long time. Having a piece that once resided in the collections of noted authorities is nice reassurance. What a fantastic example Ed! and especially with such distinguished provenance, being from the Tower Armouries and handled by these most respected gentlemen! It is indeed as you have noted, extremely rare to find armour which is homogenous, especially this old! It would seem to me that even in its working life, harness must have quickly become composite as elements became damaged and were likely substituted with replacement components as could be fashioned or found. 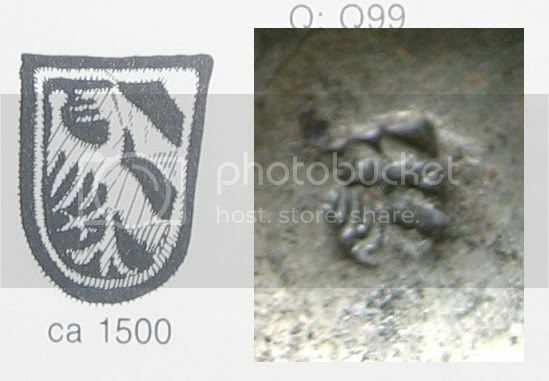 I am curious about the Nuremberg mark, is this the 'view' mark or guild mark, or these actually one in the same? It seems that Nuremberg was the most prominant armour center of the time, very much as Solingen became for sword blades. 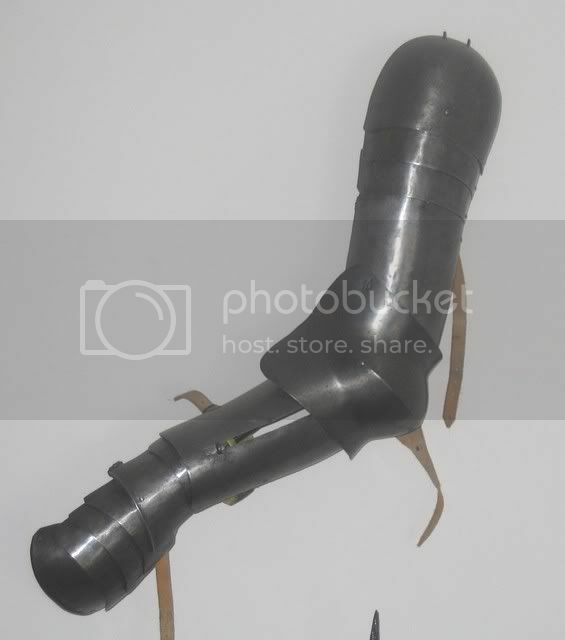 Apparantly this 'Almain rivet' is a term specifying this form of German light armour which was ideal for flexibility, and Henry VIII ordered a considerable complement for his forces. It is remarkable to find examples like this as I understand most of this armour became cannon fodder quite literally, much as with way too much important weaponry! Thank you for sharing this fantastic piece, and for the great illustration and graphics, which show clearly its status and components. I agree that we should bring in some comparitive discussion concerning the potential for fake items, which are quite separate from reproduction items. In Victorian times, copies of armour was produced for display in gentlemans smoking rooms and baronial parlors, with the first person coming to mind being Ernst Schmidt of Munich. His atelier produced I think from the 1870's to the 1930's I believe, and Andrew Mowbray wrote a book on his work. If I recall, this reference does compare items side by side and is really interesting. Here is the Nuremberg town mark with the clearer version in Der Neue Stockel. I think that the presence/absence of marks is highly variable. I would venture a guess that comprehensively marked pieces are far less common than things that are not marked at all. For example, I have a Helmschmied breastplate that is unmarked though you would think that, given the workmanship, it would have been.